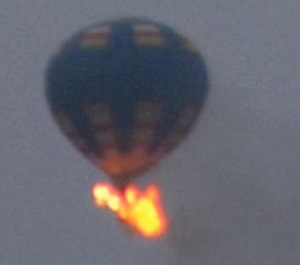 A short Friday evening flight at a balloon festival in Richmond, VA ended tragically when the passenger basket impacted a powerline and burst into flames. Three died. The pilot was a retired Army Lieutenant Colonel who had been flying balloons commercially for ten years. One of the passengers was the director of women’s basketball operations; the other passenger was the assistant head coach for women’s basketball. have FAA’s principal operations inspectors include in their general surveillance activities commercial balloon operators that hold LOA’s, especially upon initial issuance of the LOA and then as necessary, particularly if the operator is involved in an accident. As is typical for NTSB Safety Recommendations, the letter went far beyond just listing the recommendations. It also detailed the recent accident history, to explain WHY FAA needs to implement the Safety Recommendations. One example was a February 2013 accident in Egypt, where 19 of 21 on board died after the passenger basket caught fire. Two other examples cited cases where fuel control levers were accidentally jarred or fuel fittings were knocked loose on hard landings, causing fire-related injuries.